As promised, I have finally uploaded my first ebook onto youtube. This has been such a labour of love made only possible with faith that the Tongan Language School (Sydney) had in me. The goal was to make an engaging resource that our digital kids today would like. My kids gave it the two thumbs up so iʼm hopeful that you guys will to. Please share with all your family, friends, and Tongan language teachers you know. If you can, mute it and read it allowed. Iʼm sure your voice will be much more better than mine. Get your kids thinking in Tongan or English with some questions like what do you think is going to happen? Ko e hā meʻa ʻe hoko mai? What do you think happens to the mouse at the end? Ko e hā meʻa ʻe hoko ki he kumaá? Learn the days of the week by asking sequence questions What did the mouse eat on Monday? Ko e hā meʻa ne kai e kumaá he ʻaho Mōnite? Ka ʻi ai ha tō nounou pea kātakiʻi pe au. Hangē ko e lau ko e feinga pe maʻae fānau ke nau maʻu ha loto fiefia ʻo kau ai mo ha ako ki he lea faka-Tongá. This is the story of how Fuaʻamotu got the nickname, the white horse. Ko e tala eni ʻo e hoosi teaʼ ʻa ia ko e hingoa fakateneteneʼ ʻa Fuaʻamotu. 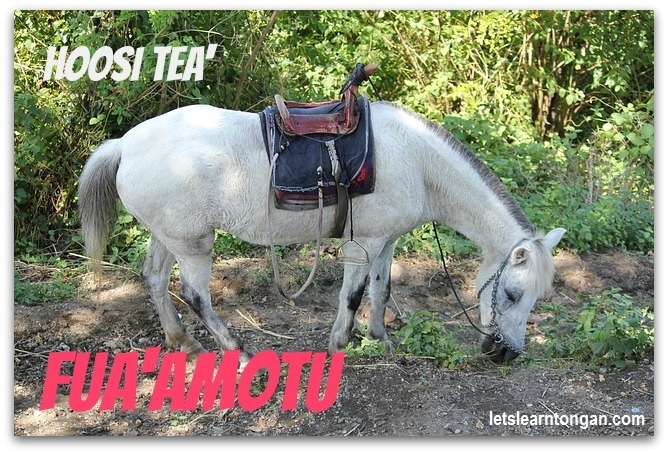 Fuaʻamotu, a town in Tongatapu has the unusual nickname of hoosi tea’ which means the white horse. According to oral stories, this name came about during the time of Tungi vaivai, either the father or grandfather of Queen Saloteʼs husband, Tungī Mailefihi. He had a brother who lived in Fuaʻamotu and who would often ride his white horse to visit Tungī vaivai in Mu’a. On one of these occasions, Tungī vaivai heard the trotting steps of a horse and he asked his minders who was that trotting towards them. Who is that trotting towards us? his people replied, it is the white horse. That is how Fuaʻamotu came to be known as ʻThe white horseʼ town. Ko e hingoa fakateneteneʼ ʻa Fuaʻamotu ne faʻu ia he taimiʼ ‘o Tungī vaivai ʻa ia ko e tamaiʼ pe ko e kuiʼ ʻa Tungī Mailefihi. Naʻe nofo ha tangataʻeiki ʻi Fuaʻamotu pea naʻaʼne faʻa ʻaʻahi ange ki Muʻa ʻo vakaiʻi ʻene taʻokete ko Tungī vaivaiʼ. ʻI he ʻaho e taha ne fanongo ʻa Tungī vaivai ki he patupatū ʻo pehe ʻange ki heʻene kau tauhi “Ko hai ʻena ʻoku patupatū mai?” Ne tali e kau Muʻa “Ko e hoosi teaʼ”. Aʻu ki he ʻahoʼni kuo ʻiloa hingoa fakatenetene ʻa Fuaʻamotu ko e hoosi teaʼ.